People are vulnerable. We get cuts, infections, and diseases that can damage us. However, we aren’t lacking in defenses; our immune system fights off invaders and protects us. Like the military, it deploys its forces to stop threats. As our white blood cells combat enemies, we may experience inflammation and parts of our bodies may redden, swell, and ache. Still, we find comfort in knowing that it is all part of the healing process. Unfortunately, some people are denied that comfort. When our body’s military is deployed in the absence of invaders, white blood cells desert their duties and cause unnecessary inflammation. Diseases that cause this kind of rogue deployment are known as autoimmune diseases. Patients who suffer from excess inflammation have limited treatment options. But, in the Dixit Lab at Yale, researchers have made progress towards a remedy. A team led by Dr. Vishwa Deep Dixit, Professor of Comparative Medicine and Immunobiology, has found a possible solution through dieting and fasting. The Dixit Lab focuses on inflammation and aging, which has led the scientists to study calorie restriction, a practice that can prolong a person’s lifespan. They found that fasting or consuming a ketogenic diet, a low-carbohydrate diet that surprisingly consists of fats, can increase the amount of beta-hydroxybutyrate (BHB) in the body. 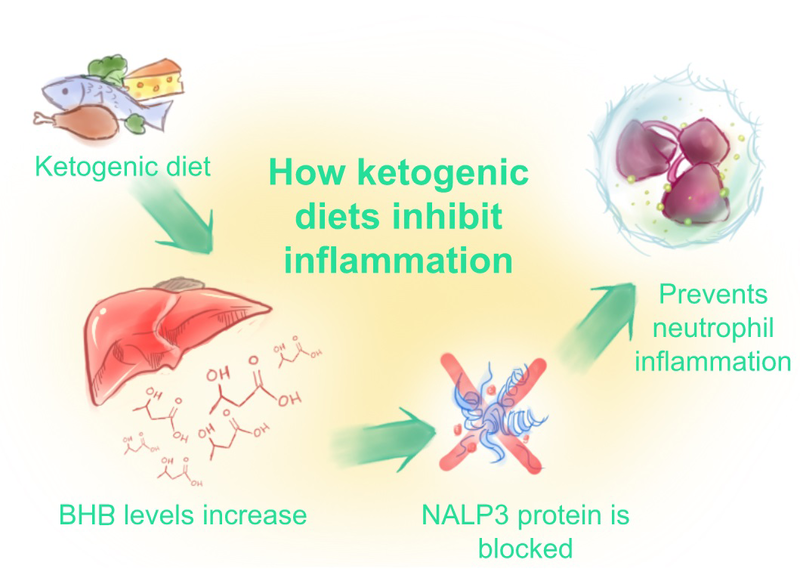 BHB is a ketone body, a compound produced by the liver, that inhibits inflammation. Ketone bodies like BHB are produced during fasting to serve as an alternative energy source for important organs. The team recently focused on neutrophils, which are highly inflammatory white blood cells. “[Neutrophils] are the cells that get recruited to the site of injury first,” says Dr. Emily Goldberg, Ph.D., a member of Dr. Dixit’s team. After stimulating these cells in a culture dish with ketone bodies, the researchers found that BHB could prevent neutrophil inflammation by blocking a certain protein. With the aid of a veterinarian at Yale, the researchers managed to induce gout in rats, which are typically incapable of contracting the disease. Then, they used a ketogenic diet to elevate the rats’ production of BHB. As their previous findings suggested, the rats were protected from inflammation. This discovery could prove very valuable because the researchers at the Dixit Lab used outbred rats. While inbred rats are a strain of genetically identical rats, outbred rats, like humans, have more variation. Dr. Goldberg added that the success of the ketogenic diet in outbred rats “indicates translational potential,” meaning that it has greater potential for human application. The lab’s goal is to help patients by providing a simple and accessible treatment for autoimmune diseases that cause unwanted inflammation. Although the current method of diet manipulation could be difficult for people to maintain, the researchers are investigating other ways to increase BHB levels. The progress made by Dr. Dixit and his team is undeniably important. It’s thanks to these scientists that people suffering from autoimmune diseases have the opportunity for better treatment. Even though some diseases can turn our immune system against us, we can still find other ways to fight back. My name is Adrienne Yu and I’m currently a sophomore at a High Technology High School in New Jersey. I spend most of my free time reading, drawing, listening to music, or attempting to play ping pong. I’m a first-year writer at cSw. Being in this program has been an enjoyable and educational experience. Hopefully, the end result is as informative to you as the process was to me. Thanks for reading! Nice article, Adrienne. It’s interesting – i just watched a documentary yesterday about research on fasting and how it can help with a number of diseases. I hope the research is successful. It’s cool that you watched a documentary about this recently. Thanks for checking out my article! Wow Adrienne! I can’t believe you wrote such a beautiful article while in high school. You did a wonderful job! Congrats. I wonder HOW calorie restriction improves people’s lives? Could this also be through the induction of keystone bodies?